I’m currently a Postdoctoral Research Fellow at the Princeton Research Institute for the Science and Technology of Materials (PRISM) working on metal-halide perovskites. The term perovskites encompasses all materials that have the crystal structure ABO3, where the A and B sites are occupied by cations and the anion is most frequently O2-. Metal-halide perovskites are a category of perovskite materials with an ABX3 crystal structure, where the A site is occupied by a monovalent cation, the B site by a divalent cation and the X site by a halide anion. Perovskite such as these have important applications in optoelectronic devices. My specific focus is on using them in solar cells and light-emitting diodes (LEDs), and in doing this, I work very closely with physicists, chemists, material scientists and engineers on a daily basis as this area of research is very inter-disciplinary. Did you get to your present position because of your background in chemistry and area of specialization or did life experience(s) take you there? It’s probably a mixture of my background in chemistry and my area of specialisation to be honest. At the undergraduate level I did degrees in both chemistry and physics and spent time as a research assistant in chemistry doing projects which were at the intersection of physical and inorganic chemistry. I love chemistry and physics equally, so I really struggled to choose one or the other. This is what really makes my research area perfect for me. I get to manipulate and explore the chemistry of the perovskite material, while using it to study device physics. It’s really a very happy marriage of both subject areas I love. 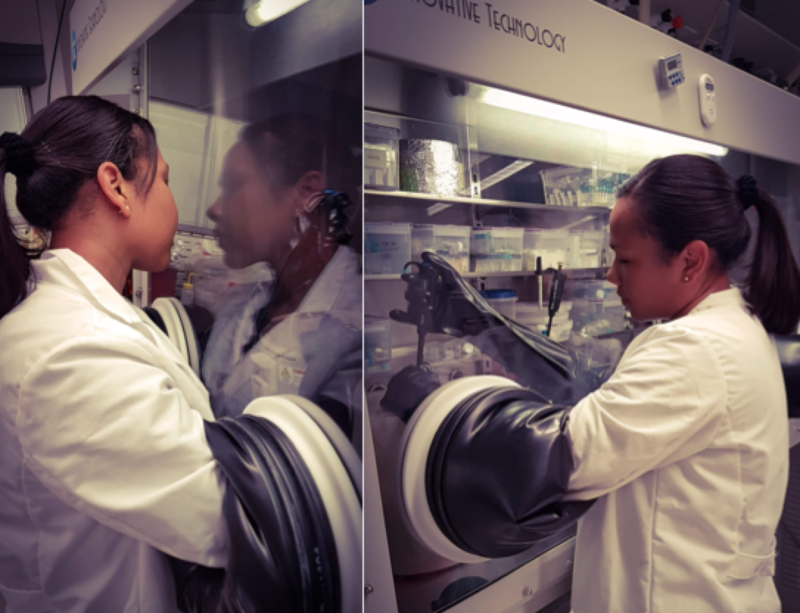 Dr. Noel spin-coating perovskite films in a glovebox. In which area of chemistry did you specialize? I specialised in physical and inorganic chemistry as an undergraduate and carried out research which was an intersection of both areas. Some of my favourite classes were on spectroscopy. It’s an amazing set of tools that give you a world of information, a bit like clues to solve a puzzle. It’s really intriguing. I’ve also done some lab teaching and demonstrations for inorganic and physical chemistry courses which I quite enjoy. It has definitely been very rewarding to see students have that “aha!” moment and be excited about their work. I did my PhD in Condensed Matter Physics at Oxford where I was one of the only students coming from a chemistry background. Largely because of the project which I chose, I still did quite a lot of chemistry. I started working on metal-halide perovskites for optoelectronic applications. A large part of the work that I did during my PhD involved the synthesis and characterisation of various inorganic and organic-inorganic hybrid perovskite materials. The characterisation of these materials involved doing a lot spectroscopy. I’ve also done a great deal of work on improving the interfaces in perovskite solar cells through chemical interventions such as charge-transfer doping and surface passivation, which effectively reduce non-radiative recombination of charges at the interfaces in solar cells, allowing more efficient conversion of light into electrical energy. Another area of research that I’m involved in is manipulating the crystallisation of thin films of the material through solvent interactions. For example, changing the nature of the solvent affects things like the colloid concentration in precursor solutions, and the kinetics of the crystallisation process, which has a marked effect on the optoelectonic quality of the resulting perovskite thin-film. Most of these things involve a fair bit of organic chemistry, so while I’ve specialized mainly in physical chemistry and inorganic synthesis, I’ve dabbled in organic chemistry quite a lot in recent years. Dr. Noel in a clean room looking at the film after having just deposited it. Do you use chemistry on a daily basis? Describe what you do on a day-to-day basis. The answer to this question varies, as it depends entirely on what project I’m working on at any given time. Currently, the answer is yes. Whether it’s developing new solvent systems for metal-halide perovskite materials or developing and testing new interface modifications for perovskite-based devices, you can usually find me in the wet-chemistry lab. After depositing the perovskite films, then comes the characterisation where I really get to test my theories. That typically involves doing a lot of photoluminescence and infra-red spectroscopy, as well as X-ray diffraction and electron microscopy. More recently I’ve found my way back to looking at solid-state NMR as it’s one of the more powerful tools I can use to answer my current research questions. 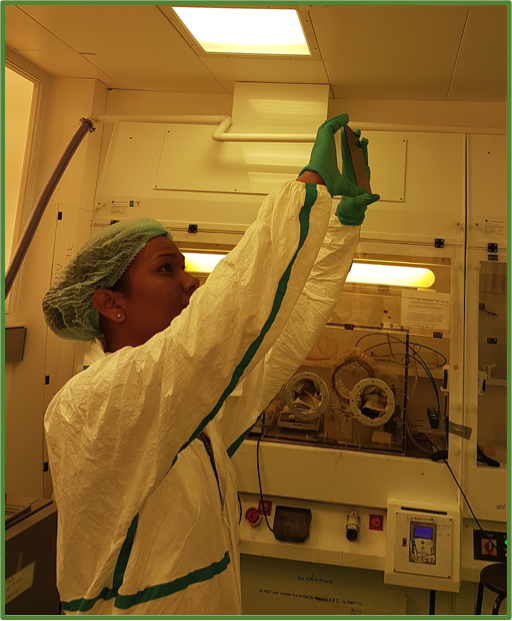 Subsequently, I usually incorporate my test films into either solar cells or LEDs to investigate whether any new materials or processes I’ve introduced have a positive effect on the efficiency and stability of devices. I place strong emphasis on applications in my work. After all, most people in this field are trying to save the world through making solar power cheaper and more efficient! Of course, after each of these steps there is lots of data analysis to be done to determine whether moving on with the current idea is useful, or if it requires going back to the drawing board. Keeping up with scientific literature is also extremely important, so I try to read a couple relevant papers a day. It’s very hard to keep up in the field of perovskites as it’s a very fast-paced field where many papers get published every day, but it’s also important because sometimes you get your best ideas from realising there’s a gap in the research space and thinking about how best to fill it. 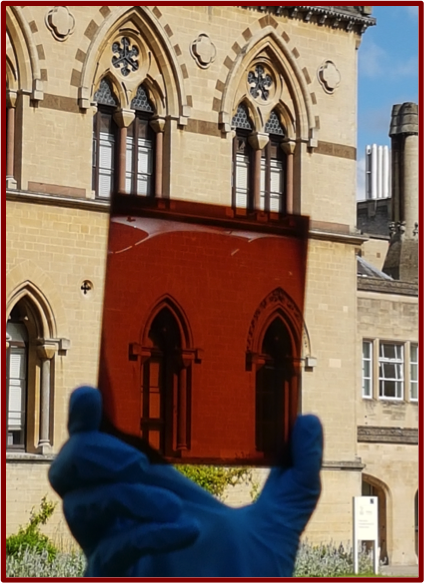 Large area film which has been deposited using a non-toxic perovskite solvent. Describe the personal skills that have played an essential role in your present position. Being able to take a step back, shake off failed experiments and reimagine feasible solutions is definitely a skill that I’ve had to develop. It’s very important as a researcher to be able to communicate both your ideas and your results clearly. Being an effective communicator is key. Another vital skill is the ability to work well as part of a team, in addition to being able to work well individually. The best research is often highly collaborative. Being able to coordinate various aspects of a project and getting a wholistic view of a problem typically leads to the best solution. Perseverance is also important. I would say about 75% of the time, things don’t work instantly. Being able to take a step back, shake off failed experiments and reimagine feasible solutions is definitely a skill that I’ve had to develop. What advice do you have for those who wish to pursue this or some other non-traditional career path? Whether traditional or not, make sure you love what you do. I’m very lucky to be excited about my research. Regardless of what path you take, it’s not always going to be easy. Loving what you do and having purpose in doing it is what gets you through the rough patches. How and where can readers learn more about this type of career? Positions like this are usually stepping stones for younger researchers who want to continue research in either academia or industry, and there are positions like this in practically every field of study. For specifically the area of research that I’m involved in, Dr. Sam Stranks provides a good introduction in his Ted Talk (below) on the subject. Another good video (below) features scientists at the National Renewable Energy Lab highlighting the potential of perovskite solar cells. The Research Whisperer is a great blog that offers good tips and resources for researchers. An additional video (below) that I recommend is interesting because of all the predictions made in it have come to pass. It is from my previous research group at Oxford. It was a perspective video for one of Henry Snaith's articles in the Journal of Physical Chemistry Letters. He is really a juggernaut in the field. I think this video covers everything that may have been missed in the others, and gives a really nice perspective with regards to how quickly the field has grown. Are there any other thoughts or lessons learned that you would like to share with our readers? If you do decide to get into research, make sure you do it in an area that you love. You don’t always have to fit into a specific mould and be, for example, strictly a chemist, or strictly a physicist. There’s always an area of research where you can find a happy middle ground. No matter what you do, you will always encounter naysayers who will try to discourage you or say that you can’t do something. You alone have the ability to prove them wrong. Editor's Note: Faces of Chemistry - Career Profiles is a project intended to help teachers and their students understand the wide variety of career paths available in the field of chemistry. If you know a professional in a chemistry related field that would be interested in authoring their own career profile or if you have a specific career you would like us to highlight, please reach out to us using our contact form.